Apparently, I’m making altered books about my family right now. Making Things Grow is about my younger sister, Katie, and explores my feelings of both being a surrogate parent for her AND a big sister. There are a lot of conflicting feelings tangled up in my relationship with my sister. Here are some pages from Making Things Grow. Mixed Media, paint, paper, ink, colored pencil, collage, rubber stamped words and hand written lettering. Your Heart Has Nine Lives is an altered book about my relationship with my youngest sister. It took me about 1 1/2 years to finish this book, which I completed in 2007. It was a tough time, too, as my relationship with Kellie has been very emotional. We’ve always been close. This book is about the years when our relationship had a mysterious falling out, which left me and her both feeling abandoned. I felt puzzled about who she is becoming. Many pages have been omitted from this online gallery because of privacy, but I’ve included enough to give you an idea of the contents! 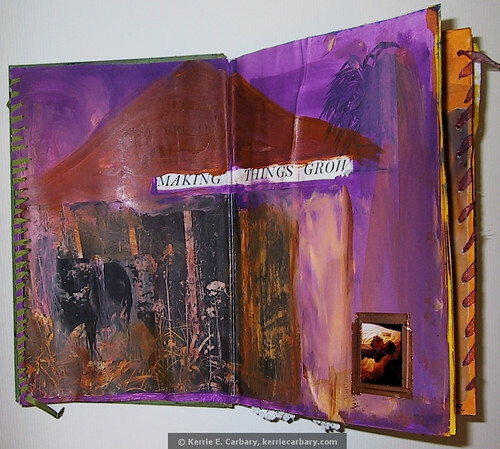 I use a lot of different materials in my altered books: paint, pastel, colored pencil, ink, collage, paper, wax—whatever seems to need to be used.